Thank you for being with me throughout my Life. Hope three of you are doing good and great, about me I am absolutely doing fine with sound in health. I feel glad and great to meet you in this letter. It has been so long that I didn't write to you. I just would love to express myself to you for your kind benevolence and just would like to say this; My life has been more beautiful and meaningful travelling by living up to you. Only through you, I have always been able to keep up to my expectations and chimeras. You are just like the wings those give me hopes to fly and dreams to cherish. You are my best friends who constantly take me nearer to my destination. You might have heard Henry Wadsworth Longfellow significant words, "In character, in manner, in style, in all things, the supreme excellence is simplicity," and this saying, "Silence and smile are two powerful tools. 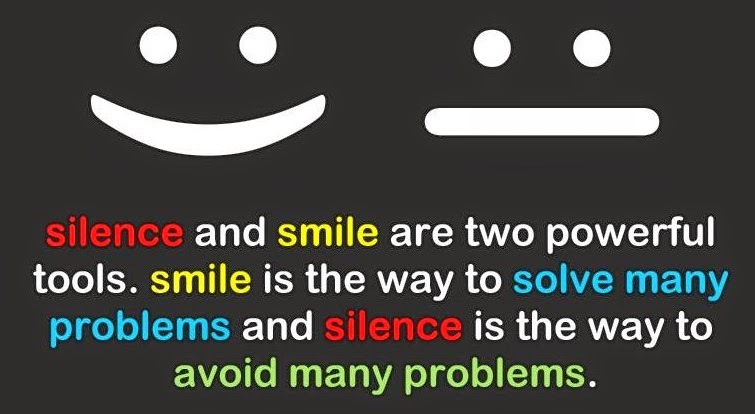 Smile is the way to solve many problems and silence is the way to avoid many problems." I thank them for making me to realise your magic, to realise your immense power because your powers have really helped me in coping up with the situations and accepting them in much instructive ways. Remembering our past togetherness, it always gives me much energy and enthusiasm to move forward and to grab the opportunity to yield. I love yielding, yielding every moment of moments. Do you remember the day, one day when we were walking among the streets, you encouraged me to smile every smile to every people we met, how great I felt when they smiled my smile and you can just feel this, how a man approached us and left us with the words, "Your cute smile has brighten me, God bless you." Do you remember the day, one day when we were going to the college, the people on the way teased and ribbed us and you encouraged me to move our way in silence to win the game. Now only I realise that we have won the game. Thank you for your impressive ideas.Recollecting these recollections of our gone joyful days, they always give me determination to heighten myself towards greatness. When I think of determination it makes me to remember Og Mandino's words, "Failure will never overtake me if my determination to succeed is strong enough." So may I borrow his words and say, "My dear SSS: Simplicity, Silence and Smile, the situation will never control me if your encouragement towards me is strong enough." Lastly, I have nothing to say apart from above interesting and memorable lines, henceforth, I promise with my best commitments to be abided by your laws in my daily life in my every doings. I know the things are going to turn out best for me in your presence, no matter what the situation is. With this lines, I look forward to meet you in my everyday life. Your constant presence in me is thanks filled and highly appreciated. God bless one and all. With much love.Take care.